Palms and other exotic plants for Scandinavia. Introduction. There are many more interesting exotic ornamental plants that can survive in the ground in Scandinavia than people generally realize. Many exotic plants, which are normally associated with warmer countries, can actually grow outdoors in at least the milder parts of Scandinavia. Of course, it is not possible to grow any species you would like and you will often have to be prepared to protect them during the winter. The possibilities are particularly high in areas which have relatively mild winters, such as western Norway, the coastal areas of southern Sweden and rather large parts of Denmark. There are some exotic plants that can survive even in areas with colder winters, provided that the summers are fairly warm. The winters 2009–2010 and 2010–2011 brutally reminded us of how far north we live and plants that previously seemed to be reliably hardy froze to death. The climate has otherwise become increasingly milder in Scandinavia in recent decades, which has made it possible to grow plants that previously would not have survived. Unfortunately, this climate change is caused or accelerated by human emissions of carbon dioxide and other greenhouse gases. If you want to know what plants will be able to grow in Scandinavia in the future then you can study what already grows in the ground in Western Europe. You can actually find many plants there which you normally would not expect to grow north of the Alps. Those who live in the colder parts of Scandinavia can study what plants that today grows in the southern and western parts of Scandinavia. Evergreen trees do no longer necessarily need to mean only conifers. 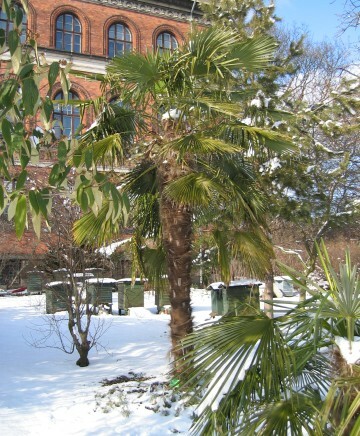 It is now quite possible to grow subtropical plants such as certain palm species and evergreen broadleaved trees in the mildest areas of Scandinavia. Some species of cacti, Yucca and bamboo can probably grow in quite large areas of Scandinavia. Fortunately, it is not just global warming that has made it possible for exotic plants to flourish. A lot of species have actually been able to survive in the past but nobody has paid attention to them. Of course, it is not always possible to grow exactly the same plants as we see in the south. In some cases, there may exist particularly hardy variants or cultivars of the same species that can survive here. In other cases, there may be related or similar species which will do fine as a substitute. Even though palms and banana plants can be very spectacular, they should only be the spice of a garden. The foundation of a garden should still be broadleaved trees and conifers. The broadleaved trees should preferably and if possible be evergreen like Eucalyptus or evergreen oaks but well-chosen deciduous trees do certainly also have their place in the garden. The chance to discover interesting plants that can do well has increased thanks to the emergence of the Internet, which has made it easier to find information and get in touch with like-minded people around the world. After all, this is a lot about pushing the limits of what is possible and then it is particularly valuable to be able to share experiences with others. Earlier, you were referred to books that were often cautious, conservative and very limited in their selection of species. Foreign gardening books tend to have a greater range of species, but are often less applicable for Scandinavian conditions. As the climate varies widely in Scandinavia, it is important to know exactly how the local climate is where you live. Although some palm species can survive in the mildest coastal areas, they are not necessarily hardy a couple of miles inland from there. You must be prepared to take chances and risk losing plants sometimes, but it is unnecessary to be right foolhardy. Sometimes you can also lose plants that previously have done well. This can of course sometimes happen even to ordinary garden plants, which are considered to be reliable. Knowledge is valuable, as in many other circumstances, and there is no use for wishful thinking. Still, it is easy to be struck by hubris after a couple of years with mild winters. By studying how low temperatures that have occurred historically, it is possible get an idea of what to expect in the future. There will hardly be any new cold records but there will certainly still be some pretty cold winters also in the future. If you know exactly how the local climate is, what the plants are capable of and what their exact requirements are, then the chance of success increases significantly. The range of exotic plants in the nurseries has often been rather poor. They have not dared to sell plants that they believed may have difficulties to survive in our climate. Often, the fear is justified, but not uncommonly is the reason pure ignorance. Some species that very well might survive, never find their way to the nurseries. However, something has happened in recent years. Many nurseries have finally dared to start selling such as Trachycarpus fortunei (windmill palm) or Musa basjoo. There have also showed up new nurseries, which have specialized in exotic plants. The range of plants in Swedish nurseries has also increased since Sweden joined the EU, which has contributed to that a number of new species have been introduced. Unfortunately, you can sometimes find plants that do not have a chance to survive the long run. If you want to get hold of more uncommon species then it is easy to order from nurseries down on the continent. Many specialized nurseries have their own websites with a wide range of species and where you can order and pay directly. Within the EU is normally no special permission required to buy plants across the borders. In Norway, it is a little bit more difficult since the country remains outside the EU but often it is still possible if you are prepared to pay extra for a Phytosanitary Certificate for the plants. If you are prepared to grow plants from seed then you can get hold of species that not might be available in any other way. The disadvantage is that the plants will be small and it might take a while before they can be planted out in the ground. However, it also has the advantage that the plants can become accustomed to our climate already from the start, which might strengthen their resistance later in life. If you have plenty of seeds you can plant out lots of seedlings in the ground and let the climate sort out the hardiest. Of course, the risk is that you can lose all the plants. There is a need for nurseries that can raise exotic plants outdoors in Scandinavia. Above all, this applies to plants that must be propagated from seed, such as Quercus ilex (Holm Oak). Even proven hardy varieties of plants that can be propagated by cuttings or grafting could be interesting to grow locally. Plants that are raised locally often have better chance to survive in Scandinavia compared to plants that are raised in warmer countries. Among other things, less hardy specimens could then be weeded out at an early stage. Another benefit is that the plants get acclimatized to Scandinavia already from the start and will then have better chances to reach their full potential hardiness. For example, Trachycarpus fortunei develops a thicker trunk in a cooler climate, which is likely to increase the chance of survival during cold winters. One thing is sure in all cases – the possibilities to find and grow interesting garden plants are now greater than ever before.